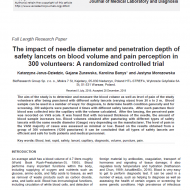 The aim of the study is to determine and measure the blood volume as well as level of pain of the study volunteers after being punctured with different safety lancets (varying sizes) from 20 s to 2 m.
Blood sample can be used in a number of ways: for diagnosis, to determine health condition generally and for screening. 300 subjects were punctured 4 times with different safety lancets. After each puncture their blood was collected into the capillary with the volume calculated. After the lancing, the perceived pain was recorded on VAS scale. It was found that with increased thickness of the needle, the amount of blood sample increases too. Blood volumes obtained after puncturing with different types of safety lancets with the same needle diameter (Gauge) vary depending on the manufacturer. The level of pain in the VASt majority of cases was assessed as minimal or low. Based on the results obtained from a group of 300 volunteers (1200 punctures) it can be concluded that all types of safety lancets are efficient and safe for both patients and medical personnel. Randomised controlled trial is a specific type of scientific experiment, and the gold standard for a clinical trial. RCTs are often used to test the efficacy or effectiveness of various types of medical intervention within a patient population. RCTs may also provide an opportunity to gather useful information about adverse effects. In recent years the performance and accuracy of self-monitoring blood glucose (SMBG) devices have been closely watched by regulatory agencies and medical professionals. Mainly, because every day thousands of patients with diabetes lance their fingers many times in order to perform self-monitoring of their blood glucose values. Male and female subjects with diabetes type I or II being in good physical and mental health were enrolled in the study. Female subjects were allowed to participate in this study only if they were not pregnant in self reporting. 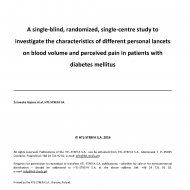 In total 60 diabetic patients were enrolled in the study. The primary objective of this study was to determine and to compare the amount of capillary blood volume collected after a single lancing of the fingertip. In addition, also the perceived pain during the lancing procedure was determined and compared between the lancets. The average blood volumes obtained with Droplet® personal lancet 33G and Glucoject® personal lancet 33G used in cooperation with Droplet® lancing device, Microlet 2 lancing device and Glucoject® lancing device were in each case higher than 4 µl except for one puncture. In 50% of pricks the obtained average blood volume was higher than 6 µl. Bleeding time was up to 2 minutes. The study results have also shown that in case of majority of patients the received blood sample volume has been higher than 0.5 µl with a total effectiveness rate of 91.67%.Perceived pain was evaluated as a secondary efficacy variable. The pain perception was measured after each prick. 3 minutes (+/- 1 minute) after pricking the subject noted in his/her worksheet intensity of the perceived pain and. As demonstrated by the results of clinical evaluations, Droplet® personal lancets 33G type 560 and Glucoject® personal lancets 33G type 560 manufactured by HTL-STREFA S.A. provide sufficient blood sample for personal blood glucose level measurements with minimal pain perception. Needlestick injuries are the number one cause of exposure to HIV and Hepatitis C among health care professionals. 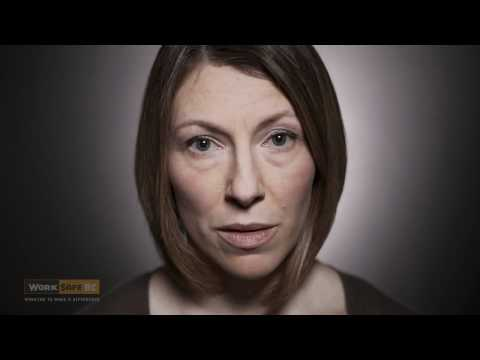 This video, prepared by http://www.worksafebc.com/, depicts the emotional impact of needlestick injuries to health care workers and their families. Avoid the use of needles where safe and effective alternatives are available. Help their employer select and evaluate devices with safety features and use devices with safety features provided by employer. Plan for safe handling and disposal before beginning any procedure using needles. Dispose of used needles promptly in appropriate sharps disposal containers. Report all needlestick and other sharps-related injuries promptly to ensure that you receive appropriate followup care. Tell the employer about hazards from needles that you observe in your work environment. For more information please visit DOWNLOADS section. Sharps injuries. 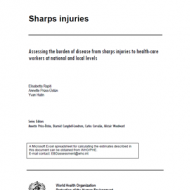 Assessing the burden of disease from sharps injuries to healthcare workers at national and local levels. This guide outlines a method for estimating the burden of disease at national or local levels from sharps injuries to health-care workers. Sharps include syringe needles, scalpels, broken glass and other objects contaminated with blood from a source patient. Health outcomes from percutaneous injuries include infections with hepatitis B virus (HBV), hepatitis C virus (HCV) or human immunodeficiency virus (HIV). 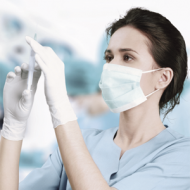 Exposure is assessed from the number of sharps injuries in health-care workers each year, and from the infection prevalence in source patients. The immunization rate against HBV, and the post-exposure prophylaxis (PEP) coverage are also needed to assess the disease burden. The assessment provides the incidence of HBV, HCV and HIV infections caused by sharps injuries to health-care workers, and the fractions of the infections attributable to sharps injuries. The number of infections that could be prevented by PEP can also be estimated. The data can be used to assess the distribution of disease burden by category of health-care worker, by ward or by activity, which would allow protection measures to be more-specifically targeted. Diabetes is a disease in which the body is unable to properly use and store glucose. Glucose backs up in the bloodstream — causing one’s blood glucose (sometimes referred to as blood sugar) to rise too high. Diabetes can cause serious health complications including heart disease, blindness, kidney failure, and lower-extremity amputations. Diabetes is predicted by a clear set of symptoms, but it still often goes undiagnosed. In some cases, there are no symptoms — this happens at times with type 2 diabetes. In this case, people can live even for years without knowing they have the disease. This form of diabetes comes on so gradually that symptoms may not even be recognized. Type 1 (10% of cases) Also known as “insulin dependent” or “juvenile diabetes”, this variation results from the body’s failure to produce insulin. Patients are required to inject insulin daily or wear an insulin pump in order to manage the disease. Type 2 (about 90% of cases) Also known as “Adult-onset Diabetes” is considerably more common and typically affects people over the age of 45, who are also overweight, results from insulin resistance, a condition in which cells fail to use insulin properly, sometimes combined with an absolute insulin deficiency. 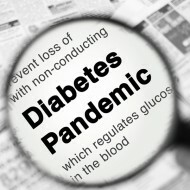 Disease management requires daily monitoring of blood glucose levels. The condition can deteriorate requiring daily insulin injections or an insulin pump. Gestational diabetes During pregnancy (usually around the 24th week) many women develop gestational diabetes. It occurs in 3-5% of all pregnancies (in other words, 1 in 20 pregnant women will develop gestational diabetes). Diabetes can occur in anyone. This disease affects all ages, genders and races. In 2013, 382 million people (8.3% of the population) were suffering with diabetes globally. However, people who have close relatives with the disease are somewhat more likely to develop it. Other risk factors include obesity, high cholesterol, high blood pressure, and physical inactivity. The risk of developing diabetes also increases as people grow older. People who are over 40 and overweight are more likely to develop diabetes, although the incidence of type 2 diabetes in adolescents is growing. Also, people who develop diabetes while pregnant are more likely to develop full-blown diabetes later in life. Diabetes is a common disease, yet every individual needs unique care. There are certain things that everyone who has diabetes, whether type 1 or type 2, needs to do to be healthy. People with diabetes and their families should learn as much as possible about the latest medical therapies and approaches, as well as healthy lifestyle choices. First of all people with diabetes need to learn how to monitor their blood glucose. Daily testing will help determine how well their meal plan, activity plan, and medications are working to keep blood glucose levels in a normal range. People with type 1 diabetes, and some people with type 2 diabetes, also need to take insulin injections. Some people with type 2 diabetes take pills called “oral agents” which help their bodies produce more insulin and/or use the insulin it is producing better. Some people with type 2 diabetes can manage their disease without medication by appropriate meal planning and adequate physical activity. Everyone who has diabetes should be seen at regular basis a diabetes specialist (an endocrinologist or a diabetologist) and should have regular eye exams (once a year) by an eye doctor expert in diabetes eye care. Diabetes is a serious disease that you cannot treat on your own – that is why people with diabetes need a healthcare professional to help them to make a diabetes treatment plan (medication; exercise and meal plan) that is right for them. Good communication with a team of experts can help diabetics to feel in control and respond to changing needs. Uncontrolled diabetes can lead to a number of short and long-term health complications, the majority of these diabetes-related conditions occur as a result of uncontrolled blood glucose levels, particularly elevated blood sugar over a prolonged period of time. Diabetic nephropathy, damage to the kidneys, which can lead to chronic renal failure, eventually requiring dialysis. Unfortunately type 1 diabetes cannot be prevented. But up to 58 per cent of cases of Type 2 diabetes can be delayed or prevented by making simple changes in our everyday lives. Modest weight loss (5-10% of body weight) and modest physical activity (30 minutes a day) are recommended goals – so it all can be boiled down to five words: Eat better and move more.